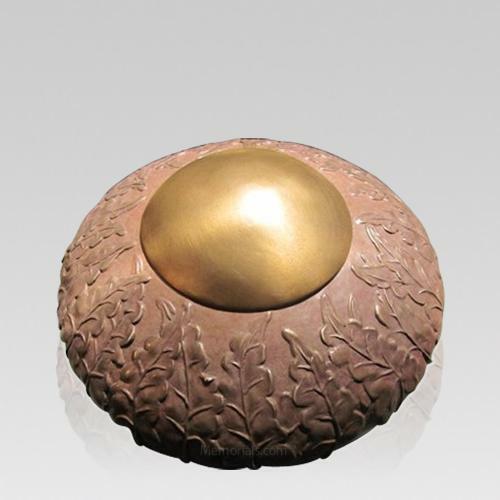 The Rustic Ivy Medium Bronze Cremation Urn is cast in solid bronze. This urn features a stunning ivy design that covers the urn, with a rustic appeal. This elegant urn is created through the ancient form of 'lost wax' method, to produce a vessel that is nothing short of a masterpiece. The medium size is also ideal for families who are scattering or sharing the remains, and will hold a slightly larger capacity than the small urn. Create an unforgettable tribute to the garden lover with this unique urn. "We absolutely love this Urn. It is beautifully crafted - very good quality work. It was very affordable, the funeral home showed us the very same box and wanted $1,200 where we only paid around $400 with you. Mother would have been very pleased."